Here is the seventh free printable in my Halloween party set for Crafty October 2015: Halloween Cupcake Wrappers – The Nightmare Before Christmas. There are 12 designs in all, across all of the printables in The Nightmare Before Christmas set with the following characters. 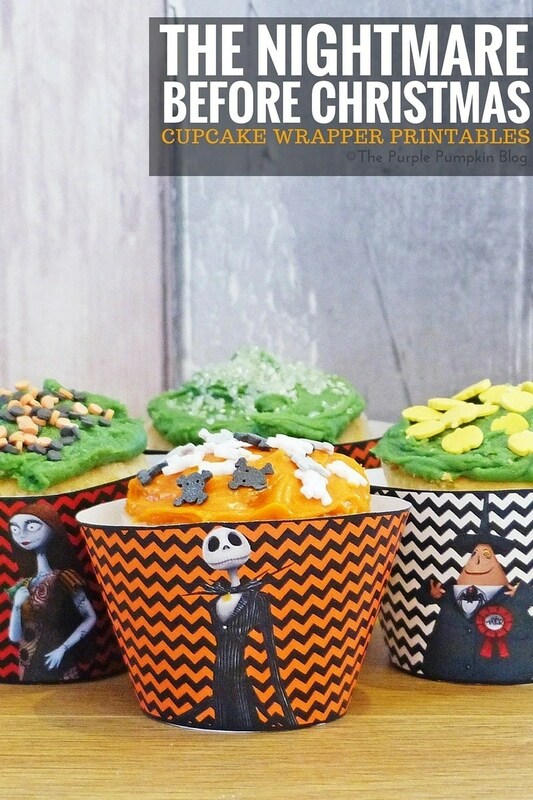 For these Halloween cupcake wrappers, I’ve also included blank ones using the 5 coloured chevron backgrounds. And if you need a cupcake recipe, you can find my cupcake archives here. Simply click the text links above, or the images below to download a sheet of the character/coloured cupcake wrappers that you want. Or you can find them all mixed together in one document here. Print off the required number of cupcake wrappers onto thin card or thick paper. Cut out and wrap around to form the case – secure with tape or glue. Place cupcake inside! Disney Halloween iPhone Wallpapers 99/#100DaysOfDisney	Things To Do In Essex This Halloween! Ooh LOVE those – Nightmare before Xmas is one of my favourite films!